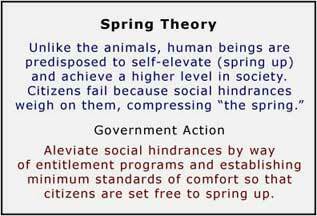 According to Spring Theory, if citizens perform poorly, social hindrances (such as poverty, bigotry, deficient education and bad parenting) are to blame. Because the problem of poor individual performance is attributed to the failings of society, it is logical that Spring Theory advocates would believe that society should come to the rescue of the individual. Social programs are a logical consequence of society attempting to remedy the problem of having cast debilitating influences, obstacles and hindrances upon the individual, causing the individual to perform poorly and behave badly. These programs will be regarded as obligatory by society and the citizens who need the assistance will be entitled to them. Minimum standards will be advocated as well, insuring that citizens are freed from the burdens cast upon them, enabling citizens to rise up and perform admirably. According to Gravity Theory, individuals fail not because of social hindrances but because they are comfortable. It is the nature of human beings to be lethargic and lazy (just like all the other species on Earth). Only when human beings are uncomfortable will they become motivated to do something. However, their motivation will be only to resolve their discomfort and they will always choose the path promising the least resistance. Only when the option of failure and being complacent makes citizens uncomfortable will citizens self-elevate and perform admirably. If citizens are made comfortable by government and if personal failure has no consequence, citizens will become and lazy and dependent. 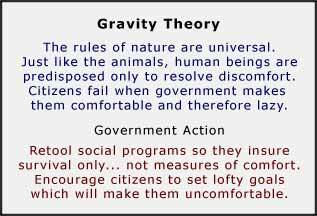 Gravity Theory advocates know that government must not make its citizens comfortable. For citizens to self-elevate and perform admirably, social programs must be retooled so they only insure survival, not measures of comfort. In fact, for social programs to be effective in encouraging citizens to self-elevate and perform admirably, social programs must leave the individuals who indulge in them more uncomfortable than the discomfort they will experience that is inherent to the process of rising up and performing admirably. The way to get citizens to self-elevate and become industrious is to inspire them to set lofty goals. The thought of unmet goals makes citizens comfortable. Citizens who have a goal (i.e. "those who chase the American Dream") are literally compelled to demonstrate admirable behavior because doing so is the shortest (and often only) path to resolving their discomfort. Those who see themselves to be a dancer or inventor or doctor or architect or owner of a restaurant or whatever find themselves uncomfortable every time they think about how they are supposed to fit in with society. The only way to fulfil their goal (resolve their discomfort) is to get up, prepare and perform admirably.